Impressive ancient strutures. Dramatic landscape. Extensive educational resources. Guided tours available. Some hikes require a guided tour. Some access is difficult. Seasonal weather extremes. At the edge of a cliff, built into the shaded recesses of a cave in the canyon wall, an ancient ghost town sits abandoned. Its sandstone bricks rise from the rock like Tetris blocks, built into incongruous patterns of walls and terraces and windows to fit the limitations of the precipice. It has been thousands of years since the feet of its residents last pattered here. A breeze of cool air blows past, carrying with it the scent of pinyon pine and the musty air of a kiva, where a ladder leads down into the dark blackness underground. Mesa Verde National Park exists to preserve the history of the Puebloan people—the Anasazi—who resided there for about 700 years between A.D. 550 and 1300. The park protects nearly 5,000 archeological sites, among which 600 are cliff dwellings. It was established in 1906 by President Theodore Roosevelt with the explicit intent of preserving the works of humans, the first national park in the park system with such a purpose. The park is best known for its stunning and mysterious cliffside dwellings. The Anasazi began residing at Mesa Verde about 1,400 years ago, abandoning their nomadic way of life to farm and live on mesas and in cliffs. Their population flourished during this period of abundance in the Southwest, growing into the thousands between 1100 and 1300. For reasons that are still unknown, the population shifted again around AD 1200, moving into cliffside dwellings that endure in the park today. By the end of the 13th century, even these were abandoned. Serious drought gripped the region, and changing long-term weather patterns made agriculture on Mesa Verde unproductive. The cliffside pueblos that made Mesa Verde famous began as simple rock shelters and evolved over time to become small, self-contained villages of their own. Built of sandstone blocks welded together with a mortar of mud and water, set in wide, shallow caves in the cliffs of Mesa Verde or atop the mesa, these complexes typically consist of a mass of continuous, small rooms connected to a ceremonial chamber called a kiva, an important gathering place for social occasions. Each room had a designated use, with some serving as granaries and others with fire hearths and tools for grinding food. Mesa Verde is a living testament to the rich cultural history of the Pueblo Indians and is one of the best preserved archeological sites in North America. Visitors to the park will contemplate the timeless mystery of the abandoned villages and the people who once lived there. Adventure to these special destinations and travel through time to an era gone by. Access to many of Mesa Verde’s sites is controlled by limiting visitation to guided tours with a park ranger. These include Cliff Palace, Balcony House and Long House archeological sites. High demand limits availability of these tours, and in most cases, visitors are limited to one tour per day. Be sure to make early reservations. Spruce Tree House, Far View Sites, Cedar Tree Tower, Step House, Badger House Trail and Mesa Top Loop Road (a car tour) are open to self-guided tours. The largest and most frequented area of Mesa Verde is Chapin Mesa, the site of Cliff Palace, also Mesa Verde’s biggest cliff dwelling site. Several of Mesa Verde’s finest destinations and adventure opportunities are here, including a petroglyph hike and astrophotography tours. Spruce Tree House is the most accessible of these, though be sure to check in with the visitor center for closures that might impact visitation. It requires no guided tour, so visitors are free to explore at their leisure, including the kiva—the Puebloan ceremonial chamber and gathering place. It’s also one of the better preserved sites in the park. With over 150 rooms and 21 kivas situated in a scenic and verdant canyon, Cliff Palace is Mesa Verde’s main attraction. While it attracts a crowd, the site was the cultural and political center of the Pueblo people at Mesa Verde. There are a couple of ways to tour Cliff Palace: ranger-guided tours by day, or twilight photography tours. Unique balcony features characterize Balcony House, ruins suited for the more adventurous visitor. The ranger-guided tour is something of an obstacle course, requiring more effort to crawl through tunnels and climb ladders, but it offers more fun for those willing to take the risk. The Far View Sites are a collection of ruins atop Mesa Verde, inhabited far longer than the cliff dwellings farther down in the park. Some 50 villages have been found here, and with little congestion, the sites are a great place to explore on the way to more dramatic sites. Second-largest of the Mesa Verde ruins, the Long House’s 150 rooms are spectacular and, billed as Mesa Verde’s most in-depth tour at two hours, more interactive than Cliff Palace, which limits visitor access to an hour. Be apprised that the drive is long from the Chapin Mesa area, but with a longer, guided tour and greater ability to explore, those with time to spare should make the Long House a priority. While the purpose of Mesa Verde is to preserve human works, that doesn’t mean that the park is without hiking trails to enjoy. Most are short, at about 2 miles long. Hikers have the option of camping at Morefield Campground, well north of the park visitor center, where the most strenuous hiking trails can be found. The remainder are around or near the ruins. The Soda Canyon Overlook is a short trail that leads to three overlooks into Soda Canyon. The first of these along the trail offers a vantage of nearby Balcony House. 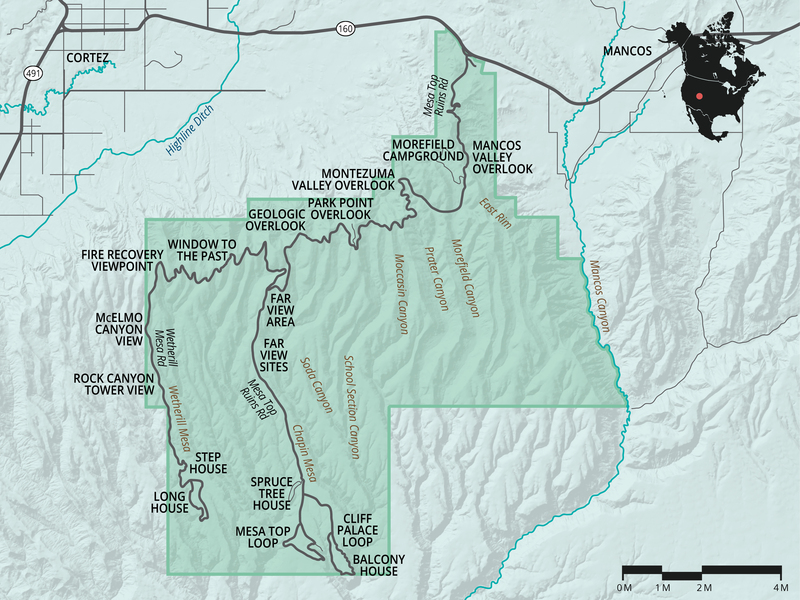 Out of Morefield Campground, the longest trail in Mesa Verde is the Prater Ridge Trail, a moderate 7.8-mile loop. Time it right and you’ll see beautiful wildflowers and long views. There is a shorter option around 5 miles in length for those who’d like to keep it short. Note that most of the trail is uphill and exposed. Beginning at the Chapin Mesa Archeological Museum, the Petroglyph Point Trail is the only trail in the park featuring petroglyphs. A short 2.4 miles also provides views of Spruce and Navajo Canyons. Mesa Verde has but one camping option about 4 miles north of the park's main attractions at Morefield Campground. That said, there are few places that are more enjoyable to camp than the high desert. The dry heat of the day cools considerably at night, sending critter and friend alike scuttling for the warmth of a campfire or a sleeping bag. The experience is intimate, and the open air and broad skies light up with stars for a spectacular show filled with shooting stars and satellites. The mesas surrounding the valley add to the campground’s scenic beauty, and wildlife is plentiful. Morefield has 252 reservable car and tent sites and 15 sites with hookups for RVs. At such a size, its sites are distanced well; campers aren’t tucked in like sardines here. The campground also offers Wi-Fi, albeit weak, and free showers. Laundry facilities, cheap gas, a general store, and a cafe are also close by. Open from early April through late October, the Far View Lodge is located 15 miles inside the park near Little Soda Canyon. Breakfast, lunch, and dinner can all be found at the lodge from their various restaurants and cafes. Wi-Fi is available throughout the lodge. Pets are permitted with a $25 per pet fee. Reservations can be made on their website. Mesa Verde is situated high on the desert plateau of the southwest, and its weather patterns follow that of the region in general. Summer daytime temperatures hover in the mid-80s, while winter daytime temperatures hover in the 30s. However, there is vast fluctuation in temperatures from night to day, and cold weather layers are required year round. At elevations between 6,500 and 8,500 feet, it is arid, receiving on average no more than 1 to 2 inches of rainfall each month. Snowstorms can occur from October to May, and afternoon thunderstorms are common in July and August. As with all national parks, pet activity is limited at Mesa Verde. With the exception of service animals, pets are not allowed on most trails, in archeological sites, or in buildings. They are allowed on paved roads, in parking lots, and at campgrounds, and they must be leashed at all times. Pet-friendly trails include some of those on Wetherill Mesa and Long House Loop. We were there April 24 & 25, 2017. Mid 30's temperatures & snowing.